The Man United manager has accused his critics of trying to get him fired. Jose Mourinho at full-time on Saturday. 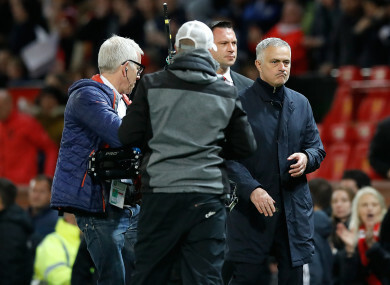 JOSE MOURINHO ACCUSED his critics of staging a “manhunt” to get him sacked after Manchester United rescued their under-fire manager with a dramatic 3-2 win over Newcastle on Saturday. Just hours after a report emerged that Mourinho would be sacked regardless of United’s result against Newcastle, his team were rocked at Old Trafford as they conceded two goals in the opening 10 minutes. But after being booed off at half-time, United avoided going five games without a win thanks to a thrilling second half fightback. Juan Mata’s free-kick was followed by Anthony Martial’s equaliser, setting the stage for a 90th minute winner from Alexis Sanchez, who had been dropped by Mourinho before coming off the bench in the second half. “As a friend of mine was saying to me this morning, if it rains in London tomorrow, it’s my fault. Brexit, it’s my fault. I have to be ready for this. There is a lot of wickedness and a clear manhunt,” Mourinho said. “In the end we won the match and I think we deserved to win. I think the fans deserved to win. At 2-0 at half-time, with all the dynamic of the man-hunting, I think they behaved amazingly well for the team. This is what a football club is. “The industry I work in is different, a lot of wickedness, too much wickedness in something that should be beautiful. Mourinho insisted he wouldn’t be affected by the doubters claiming he has lost control of his club and is destined for the axe. Instead, he claimed the criticism was more of a problem for players who froze under the spotlight. “In the biggest clubs in the world there are periods with a lot of meat and periods with a lot of bones,” he said. “I am 55 years old, I am mature, I can cope with it and live with being hunted. I think some of the boys are not coping well with it. “The way they started the game was panicking. I thought at some moments we could score in our own goal. It’s not easy for them. Amid all the talk of shattered relationships with Pogba, Eric Bailly, Luke Shaw and Antonio Valencia, who was left out of the squad, Mourinho was adamant the fightback showed he retains the squad’s support. “It’s ridiculous talk to say they don’t play for the manager, they play for the club. It’s not about that,” he said. “What I asked the players is to give absolutely everything. Email “'If it rains in London tomorrow, it’s my fault. Brexit, it’s my fault' - Mourinho slams critics after United escape”. Feedback on “'If it rains in London tomorrow, it’s my fault. Brexit, it’s my fault' - Mourinho slams critics after United escape”.